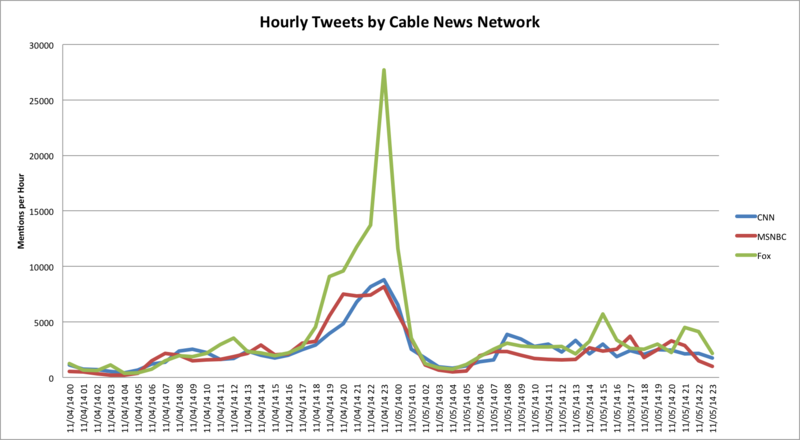 What’s interesting, but expected, is that the mention levels were roughly the same across the three networks until the election coverage kicked off at 6pm, and then the growing realization that the republicans would control the Senate drove Fox News’ tweets way high while MSNBC’s and CNN’s mentions remained subdued. Florida’s 18th congressional district is one of the more interesting races this mid-term year. The incumbent, Patrick Murphy, won his seat by defeating the highly controversial Allen West. But the district as a whole is not a strong one for the democrat, with most predictions seeming to put it at “lean” democratic. That has generated a large number of GOP contenders who will face off in this month’s primary. For reasons that escape me, the GOP as a whole has not focused resources on this district, and the primary is still a large scramble. And there seems to be no recent polls, which makes it hard to know what’s happening. We’re coming down to the wire to August 26 primary here in Florida, and there’s few races that have the huge scramble like the GOP primary for Florida’s 18th congressional district. So how are the candidates doing on Twitter? The chart shows two things: in blue, the total number of tweets mentioning the candidate and, in red, the number unique people on Twitter with one or more tweets that mention the candidates. 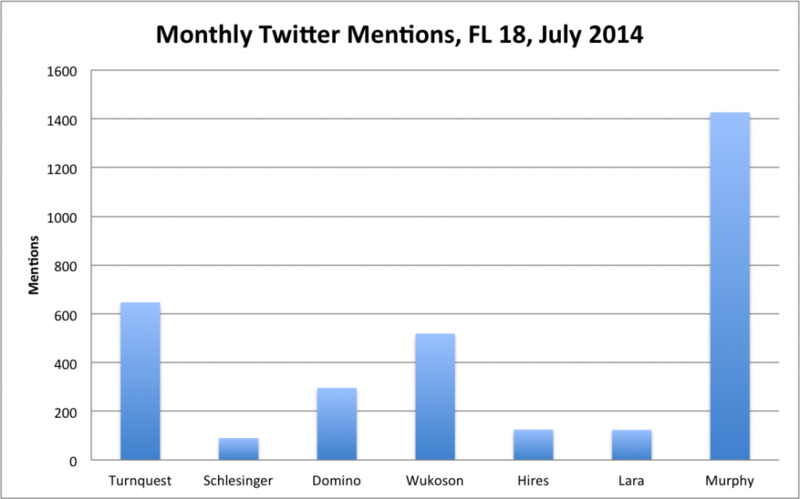 Patrick Murphy, the democratic incumbent, has the most mentions — as is to be expected by a sitting congressman. On the GOP side, Calvin Turnquest continues his strong social media presence but has been joined by Nick Wukoson at the top of the mention column. About 80% of Wukoson’s mentions were bunched in a 11-day period from 6/15 to 6/25 with the rest of the month having single digit days. This resulted in Turquest having a much higher median number of tweets per day than Wukoson even if Wukoson had a slightly higher total overall. And there are other reasons to suspect that Wukoson’s burst of social media activity will be short-lived1. Notice who isn’t being mentioned in the race: Carl Domino, the purported front runner. A lack of social media savvy is not a good sign should he go on to face Murphy in November. 1: Wukoson’s lack of consistent mentions, his lackluster performance in May (66 mentions to Turnquest’s 594), and that 57% of Wukoson’s mentions were from him and his campaign manager make me question whether he will continue to rack up the mentions in July. Let’s say you poll a random sample of 1,000 residents of Boston and New York City, each, about who they think the best football team is. You could expect a few to pick who they think will win the super bowl but, by and large, people in Boston will say “Patriots” while people in NYC will say either “Jets” or “Giants”. Nothing surprising there, and you really wouldn’t learn anything other than that people root for their home team. Add up all the choices, and you’ll find that about 50% of the people you asked said Patriots (the 1,000 people you asked who are in Boston), about 30% said Giants, and 20% said Jets(1). No surprise, right? So what do you tell people? Why, you tell people that “People in Boston and New York said that the Patriots are their favorite team”! Because, of course, in your poll, the Patriots came in first. And what would people say about your analysis? Well, in Boston, they’d say “of course, that’s right!” and you’d get a pat on the back (so to speak). In New York they would say “bite me” (or similar) and I hate to think what they’d do to you. Everywhere else they’d just call you an idiot for your analysis. And, to be fair, you’d actually be an idiot for making such a claim. So it’s surprising, to say the least, to see that Quinnipiac University has become the source of just this kind of idiocy. They conducted a poll that asked people who the worst post-WW2 president is. And in this version, Boston, the republicans, overwhelmingly said “Obama”. And the New Yorkers, aka the democrats, split their worst-president vote between their two least-favorites: George W Bush and Richard Nixon. And, so, Quinnipiac reports, breathlessly, that “Obama Is First As Worst President Since WWII”. Just like the Patriots are first as the favorite football team in Boston and New York City. It’s not really true except in a meaningless way, but it sure sounds shocking, and it is getting them a lot of publicity during an otherwise very quiet week. (1) That 60/40 breakdown is a guestimate based upon some quick googling. If it’s wrong, it doesn’t affect the analysis. Nonetheless, I apologize to Jets fans unreservedly.